Your friend just called and said that she’d like to drop by in about half an hour. You take a look around the living room and realize that your carpet looks disgusting. Whether it’s overdue for a professional cleaning or you just haven’t had time to clean in a few days, you need to make the room look great in record time. Follow these tips to give the carpet a quick clean in 30 minutes or less. 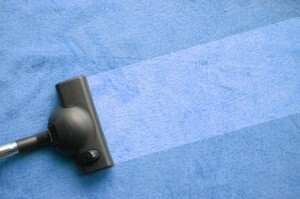 These don’t replace professional carpet cleaning services, but they will help you make the room look great in a pinch. What really makes the carpet look bad isn’t the slightly muted colors or the stain from a spilled drink. The real problem is trash and clutter that’s on the floor drawing attention to the carpet. Make sure that the focal point of your room is anything but the floor by taking a few minutes to get the trash up, pick up the toys and put the basket of laundry in another room. Now that the carpet is picked up, take five minutes and run the vacuum cleaner over the entire area. Normally, you would go slowly and work in different directions. However, you can get away with a fast vacuuming for the purposes of this speedy clean up. Move in one or two directions, and work around the furniture to make it a little faster. Get the box of trusty baking soda out of the cabinet and sprinkle it over the carpet immediately after vacuuming. The baking soda will absorb grease, dirt and odors in the carpet, but you have to let it sit for a few minutes to make it really effective. While the baking soda is working its magic, you can continue with your flight-of-the-bumblebee cleaning. People take everything in, but the carpet won’t be high on the list if it looks decent. Make sure the rest of the room is clean by putting items away and running a microfiber cloth over the wood furniture. With the dust picked up and the room relatively clean, the carpet should fly under the proverbial radar. Now is the time to vacuum up the baking soda and as much dirt as possible with it. You can go a little slower if time allows to pull up the soda and leave your carpet as clean as possible. Work in opposite directions to clean the carpet quickly and thoroughly before putting the vacuum away and waiting for your friend. It’s a bit of a cheat, but it’s one that works. It’s harder to notice discolorations and carpet stains if the lights are just a little lower than normal. If it’s daylight out, just open the curtains and let the sun illuminate the room. In the evening, only turn on enough lights to make it comfortable without flooding the room with light. After your friend leaves and your heart rate returns to normal, call for professional cleaning services for your carpet. A clean carpet will look fantastic after a quick cleaning like this, but one that’s been neglected for a while will still look tired and dingy. High Quality Carpet offers quality cleaning services for all the carpets in your home, so you can always be ready for company with just a fast cleanup.